Shares in Europe are set to open flat as persistent weakness continues to temper the bulls. Despite US markets continuing to plough ever higher, that optimism is being offset by European traders focussing on weak domestic factors. Yesterday's fragile manufacturing and services PMI figures were another indication of how precariously balanced Europe's economy is on the edge of recession. On Monday, Draghi said that the ECB will consider doing more but wants to assess how well the current tools are working before acting again. Well, the measures don't seem to be having any immediate impact, so traders will be on the lookout for some dovish comments from Draghi when he speaks this morning. Positive data and better than expected earnings from retailers pushed the Dow into further highs yesterday. After taking a hit following weak cues from Europe and Asia, US equity markets were able to bounce back and finished 0.2% up on the day. Whilst this is another sign that the economy is improving, is it enough to raise interest rates? European equities are set to open flat following an uneventful FOMC Meeting Minutes release. The timing of the first rate hike remains data dependant, but the minutes suggest that there was plenty of discussion over the semantics of the 'considerable time' phrase, though nothing of any real significance for traders. One event that should be of huge significance for UK spread traders is the Rochester by-election. Most traders will be looking to UK Retails Sales for direction, but the implications of today's by-election dwarf the importance of one little data point. If UKIP can come out of nowhere and overturn a Tory majority of 10,000, even with a defecting incumbent candidate, we could be seeing not only the downfall of the traditional Tory party but of the two party political system. A UKIP win could split the Tories along pro-Europe/Eurosceptic lines and even inspire a leadership challenge on David Cameron. The 2015 General Election result may end up looking like a continental rainbow coalition government and that is exactly what you do not want when we still have the huge issue of the deficit to get under control. In the US, yesterday's Fed minutes were something of a non-event. Janet Yellen repeated the phrase that interest rates would stay near zero for, 'a considerable time', but made no further inroads into when that would actually be. As a consequence, equity markets spiked up but then immediately retraced and ended the day flat. We are set to see European equities open flat to marginally higher this morning. After yesterday's ramp higher, traders are set to ease off the accelerator ahead of central bank meeting minutes. Today sees minutes from the BoE and, after Carney and Haldane expressed their concerns about low inflation earlier in the week, markets will want to see how prevalent this fairly recent worry is amongst the rest of the MPC. Disinflationary storm clouds seem to be spreading out all over the global economy, with even the US failing to hit its target, and the issue seems to be overtaking that of growth. Previous concerns that a strong UK economy would necessitate a rate hike sometime in 2015 seemed to have subsided and the issue of importing disinflation from Asia and the continent is becoming more prominent. However, for equity markets at least, this is a big green light to get long as one of the only tools to fight such a problem is loose monetary policy. The Dow Jones Industrial Average staged another micro-rally on Tuesday to close at a new record high for the 26th time this year. With the latest FOMC minutes released today, investors will be looking for clues on whether the central bank is going to keep interest rates low deep into 2015. If we can combine that with some solid housing data, then the US economy will be in pretty good shape. The prospect of continued loose monetary policy is seeing European markets creep higher this morning. Although stocks have continued to power ahead over the last month, this is against a backdrop of deep concerns about the global economy. David Cameron's unusually insightful warning of flashing red warning lights is something that traders have been uneasily storing in the back of their minds during this rally. However, since the financial crisis, central banks have always been there to pick up the bulls when they seem to be flagging and that doesn't look like it's going to change any time soon. Once again Mario Draghi managed to do something without actually doing anything, hinting that sovereign bonds could be included in future unconventional tools. In addition, Mark Carney's 'huge disinflationary forces' comment seems to have pushed expectations for a BoE rate hike back to 2016. With such dovish forces in the air, it must be hard for anyone to remain a bear. The Dow Jones continued to rally on Monday, brushing off news of recession in Japan with considerable ease. Large cap stocks seem to be outperforming the smaller cap stocks as investors show an inclination towards trading the more liquid stocks. 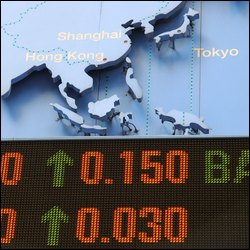 European stock markets are set to open lower following news of Japan's dip into recession. Whilst traders hit the sell button on the headline figure, there's already a silver lining to the story as the second sales tax hike, which was due to be introduced next year, is likely to be indefinitely delayed. As a result, the Nikkei 225 is already managing to pick itself up from the initial lows. However, as much as some investors like to lament Japan's financial mismanagement, those in Europe can't really talk given that Friday's GDP figures just skimmed the bounds of acceptability. Traders will be looking to today's testimony from Draghi for clues as to how Europe can avoid a similar fate to Japan. Expect him to reiterate his line that monetary policy can only do so much and that fiscal policy needs to be reformed, but watch out for hints that he may help out with some unconventional tools. US stock index futures look set to open significantly lower after reaching all-time highs last week. With Japan plunging into recession after missing the mark on third quarter GDP figures, we have seen an adverse effect on stocks and America is looking to follow suit.